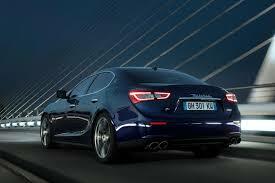 The Maserati Ghibli is the infusion of seductive styling, melodious hum from the engine, and playful driving. There are four variants of this beauty of just about 2 tons. A 3.0L twin turbo V6 engine puts out 345 horsepower and 369lb/ft of torque. All of the variants have an excellent 8-speed ZF automatic transmission. The Ghibli emulates most of the larger Quattroporte’s features, only it is smaller. It packs 6.8 inches between the front and rear wheels, but it is also 110 pounds lighter. Adding to its light weight are the aluminium doors. A mechanincal rear differential is common among all the variants.